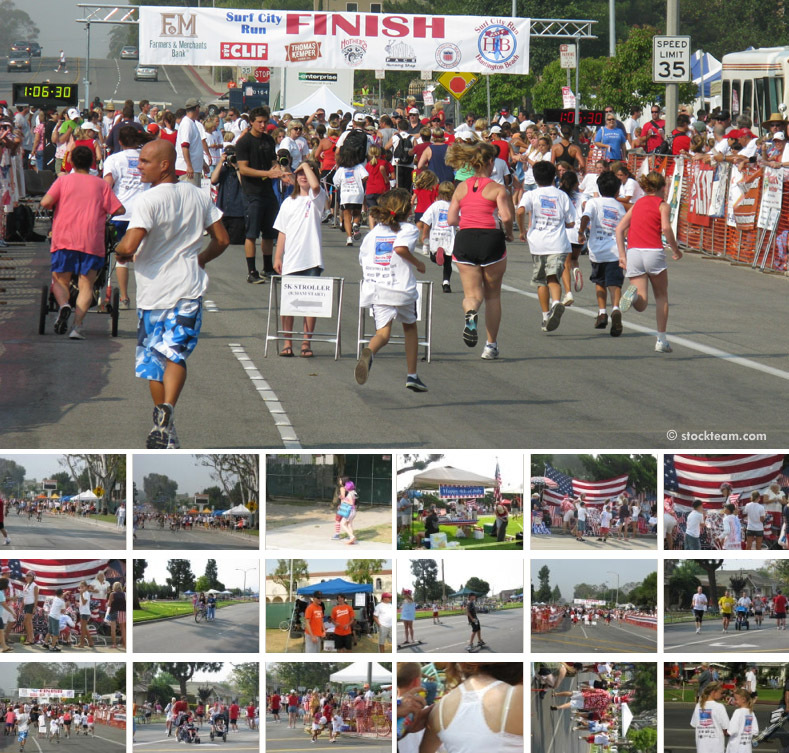 Surf City Run before the 4th of July Parade is held the same morning (July 4) and is generally considered a fun run. Children's, baby buggy, youth and adult runners take to the streets of downtown Huntington Beach, running much of the 4th of July Parade route (and more) in a morning of exercise that can also include walking if you prefer. Runners get a t-shirt and bragging rights to say they participated. The Surf City Run usually begins around 6 a.m. with categories staggered in their start times, and the running gates are taken down by 9 a.m. before the Parade. A vendor's expo for runners offers an assortment of samples and coupons, demos, etc. for running and athletic related products. Pancake Breakfast in Lake Park - 11th & Main 6 a.m. to 10 a.m.
Huntington Beach 4th of July Parade - Main Street 10 a.m. to 12:30 p.m.
Pier Plaza Entertainment - Main and Pacific Coast Hwy. 1 p.m. to 8 p.m.
Fireworks Extravaganza - Huntington Beach Pier - 9 p.m. to 9:30 p.m.
Pier Plaza Fun Expo - Main & Pacific Coast Hwy. 12:30 p.m. to 8 p.m. The Huntington Beach Pier is partially closed to the public all day and completely closed at 5 PM. Fireworks are launched from the end of the Pier. The fireworks start at 9 PM. PCH is closed from Golden West Street to Beach Blvd. from 7 PM until traffic has dispersed, estimated to be around 11 PM. Huntington Street is closed to through traffic between Atlanta and PCH.